Styx reminds me of things American, apple pie and baseball games, and things a bit laid back, like sitting barefoot on a porch in denim overalls swigging homemade moonshine from a jar. I may not be a native American, but I am proud to be an American citizen and a Styx fan. Before I go off on a rant that compels me to sing “The Star?Spangled Banner” off key in horrid pitch let’s get to the show. 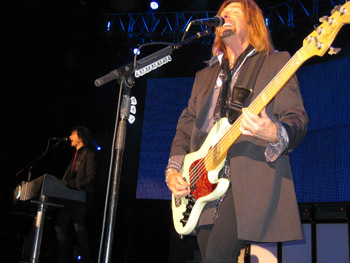 On May 25, 2010 Styx played the Concord Pavilion. 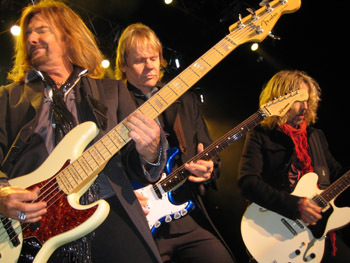 Styx played a 12?song, 75?minute set from 8:00 to 9:15. 1. Borrowed Time/Mr. Roboto/Rockin’ the Paradise/Borrowed Time (Cornerstone/Kilroy Was Here/Paradise Theater records, 1979, 1983, 1981). The first song was comprised of a three?song medley that began with Borrowed Time. Approximately (approximations presumed throughout) the first 45 seconds of Borrowed Time featured a pre?recorded tape track of a cascade of keyboards. 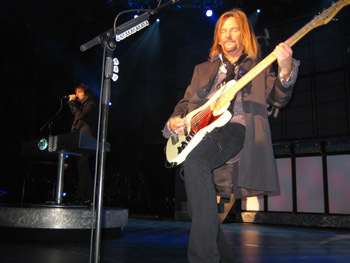 Lawrence Gowan (“LG,” vocalist, keyboardist, guitarist), Tommy Shaw (“TSh,” vocalist, guitarist), James Young (“JY,” vocalist, guitarist, keyboardist), and Ricky Phillips (“RP,” bassist) came on stage and stood with their backs to the crowd one foot in front of Todd Sucherman’s (“TSu’s,” drummer) drum set. 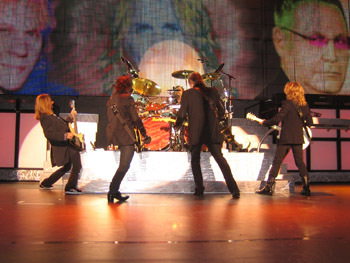 Alternating images of the Styx logo and band member headshots appeared on the video screen that stretched to the ends of the large stage. The video screen was comprised of 44 rectangular?shaped panels mounted in two rows, each containing 22 panels. TSh, JY, LG, and RP repeated three?chord progressions four times augmented by TSu’s drum fills. LG took his guitar off and stepped atop a pearl?colored, three?feet high keyboard riser positioned stage right. TSh sang the first two verses that featured a catchy melody and mid tempo pace. LG, RP, and JY then sang the first chorus at a slightly high octave, “Livin’ high, livin’ fine. Livin’ high on borrowed time.” The chorus featured a chugging, recurring riff. The band skipped the part where they repeatedly exchange the words, “yes … no” and went straight to a 15?second JY guitar solo he played on his electric blue Fender Stratocaster. TSh then played a searing 30?second guitar solo on his ivory Gretsch guitar during which JY, LG, and TSu provided solid rhythmic accompaniment. TSh’s guitar solo led straight into a 20?second repetition of the chord progression from the start of the song. LG then repeated the second half of the second verse with slightly varying lyrics followed by a second TSh guitar solo. LG then sang the third and final verse. 3. Too Much Time on My Hands (Paradise Theater, 1981) is an up tempo song sung by TSh that began with punchy keyboard and bass lines augmented by TSu’s simple, yet effective, drum beats. The song features a very catchy chorus that led straight into TSh’s 40?second guitar solo during which LG continued to play colorful keyboard notes. TS wore black combat boots, black jean pants, black blazer, off black satin shirt with a checkered bright red pattern, and bright red fringed scarf. TSh then sang the third verse and second chorus. 4. Lady (Styx II, 1973). LG sang the first half of the first verse of this sentimental ballad in the spotlight accompanied solely by his keyboard melody. LG wore black leather shoes, tight black jean pants, black blazer with satin lapels and rhinestone?laden sleeves, long?sleeve black satin shirt with an embossed honeycomb chest pattern, and maroon tie with a subtle light blue and silver floral pattern. [LG looked dapper. The tight pants and rhinestones qualify LG as the Neil Diamond of the band. My only concern was that LG’s shoes pose a tripping hazard. The sharply pointed tips elevated one?half inch above the ground along with the one?inch heels are so high they resemble an anvil, posing the threat of causing an unsuspecting band mate to trip.] LG played a silver keyboard with a gold “Styx” logo. When LG sang the second half of the first verse he was joined by RP’s subtle bass lines and TSh and JY’s recurring guitar notes. TSu’s solid drum beats elevated the song’s tempo to a mid tempo power ballad as LG smoothly transitioned from the first verse to the first chorus. LG jumped off his keyboard riser, walked around stage, and ascended/descended the two sets of seven pearl?colored steps positioned on each side of TSu’s drum set. Stage left of the steps were eighth Marshall guitar amplifiers (“amps”) with shimmering silver mesh covers. Stage right of the steps were four Ampeg SVT bass amps with a silver mesh cover. Positioned on the outer side of each set of amps was an additional set of seven pearl?colored steps. LG then sang the second and third verses, the latter augmented by TSu’s prominent solid beating of his tom?tom drums. 5. Lorelei (Equinox, 1975) began with a fairly soft tinge and prominent keyboard melody. TSh and JY added guitars during the third line of the first verse. TSu joined in with a rollicking drum fill right as JY sang the final word of the first verse, escalating the song’s tempo to an up tempo pace. JY then sang the first chorus after which the song’s tempo momentarily decreased to its initial pace only to then escalate back to an up tempo pace as JY sang the final word of the second verse. The second verse led straight into the second chorus, which was followed by JY and TSh guitar solos. 7. Suite Madame Blue (Equinox, 1975). Before Suite Madame Blue JY said, “Tommy Shaw has brought out a classic Fender 12?string guitar made in these United States. And on that instrument he is going to play for you.” [JY spoke with such conviction and patriotism I thought he was going to don a top hat and tailcoat bearing stars and stripes and make the presidential State of the Union address.] LG sang the first verse atop the top step adjacent stage right of TSu’s drum set and augmented by TSh’s melodic guitar notes, RP’s bass lines, and TSu’s light cascading cymbals. The first two minutes of the song had a soft tinge. When LG began singing the second verse the song shifted to a mid tempo power ballad replete with TSu’s powerful drumming, RP’s prominent bass lines, as well as TSh and JY’s guitar chord progressions. The second verse is when LG arose, walked down the steps, and came stage front. When LG paused and sang the final two words of the second verse, “… heaven’s door” the song’s tempo shifted to its initial soft tinge. After the second verse LG returned to his keyboard riser and played an atmospheric 50?second keyboard piece augmented by TSh’s 12?string electric guitar. JY then converted the song to an up tempo pace by playing a fairly heavy guitar chord progression augmented by TSu’s solid drum beats. LG jumped stage front while JY played the chord progression with plenty of left?hand vibrato on his tobacco sunburst Fender Stratocaster. TSh, RP, and TSu jammed while JY played a 20?second guitar solo. JY wore black leather shoes, black wool slacks with satin vertical stripes and black button?sized studs on the outer sides, black blazer with satin stripes on the outer sleeves and bordering the outer hip pocket covers, short-sleeve black cotton shirt, and fairly thin gray tie with a subtle gray floral pattern. [JY looked classy and better without a moustache. When I see pictures of JY from the 1970’s and 1980’s sporting a fairly bushy moustache it reminds me of Ned Flanders (devout Christian and next door neighbor to the Simpson family in the the animated television series, “The Simpsons”). If JY still sported a mustache I would not be surprised if his stage rap included the phrase, “Okely dokely.”] LG then sang the third verse with his blazer off as the video screen displayed aerial images of the San Francisco skyline. 8. Fooling Yourself (The Angry Young Man) (The Grand Illusion, 1977). Before Fooling Yourself (The Angry Young Man) TSh said, “Can you feel it my friends! Mr. Ricky Phillips on the bass. How about the beats, the drums, is it working for you? Thank Mr. Todd Sucherman. This would not be possible without a couple of brothers from the South side of Chicago who got together in their basement. Mr. Chuck Panozzo!” Chuck Panozzo (“CP”) came on stage to the audience’s surprise and adulation. CP wore sunglasses, faded blue jeans, a black blazer, and black long?sleeve shirt the back of which featured rhinestones (or small studs) in the shape of an eagle. [CP looked tough, particularly with his sunglasses and shirt with rolled up sleeves and eagle?encrusted insignia. CP could have easily been mistaken for a Motörhead road crew member or biker in László Benedek’s outlaw biker film, “The Wild One” starring Marlon Brando (1953).] RP played a double neck guitar with a 12?string upper neck. Fooling Yourself (The Angry Young Man) began with LG’s light?tinged, prominent keyboard notes augmented by TSh and JY’s acoustic guitar strumming and TSu’s cymbal crashes. At the 1:20 mark the focus shifted from LG to TSh and JY’s up tempo acoustic guitar strumming, and LG jumped off his keyboard riser and came stage front where he encouraged the audience to clap along. LG then returned to his keyboard riser and provided subtle keyboard accompaniment as TSh sang the first verse and chorus, the latter featured vocal exchanges between TSh and JY, LG, and RP. TSh sang the first two chorus lines while JY, LG, and RP sang the rest and also repeated the first few words of TSh’s parts. The video screen displayed alternating images of the phrases “Get Up” and “Come On.” LG then played a catchy 40?second keyboard solo augmented by RP’s steady bass lines. LG rotated his single silver keyboard 180 degrees and played part of his solo facing the crowd with his body stretched forward, and his hands nimbly hitting the ivory keyboard keys behind his back. [LG looked like he was stretching to participate in the 100?yard hurdle competition, and his skin tight jean pants resembled spandex workout pants.] After LG’s keyboard solo the band sang the second chorus followed by a 70?second jam during which TSh, JY, CP, and RP stood next to one another center stage. Styx has been exceedingly supportive of CP’s valiant efforts battling H.I.V. In 1998 CP revealed to his band mates he was gay and battling this potentially deadly virus. As a founding band member who formed Styx in 1961 along with his late fraternal twin brother, John Panozzo (original drummer), and Dennis DeYoung (original vocalist, keyboardist), CP’s band mates have encouraged him to participate on a part?time basis as health permits. John Panozzo died on July 16, 1996 at age 47 due to excessive drinking that caused him to develop cirrhosis of the liver and eventually succumbed to gastrointestinal hemorrhaging. The first chorus featured vocal exchanges between JY and TSh, LG, and RP. JY sang the first part of each line while TSh, LG, and RP sang the last two words, “Well aren’t you Miss America. Don’t you Miss America. Won’t you Miss America. Our love.” LG came stage front and encouraged the audience to clap along. After the second chorus LG played an upbeat 20?second keyboard solo immediately followed by JY’s 25?second guitar solo during which TSh, RP, and TSu continued to play the catchy up beat rhythmic accompaniment. JY’s guitar solo was followed by the third chorus, fourth verse, and fourth chorus. JY then six times repeated the phrase, “Miss America,” and the song climaxed with him screaming, “Miss America!” When the song concluded TSh said, “You know it. James Young plays for keeps.” Miss America and two other songs to be performed received the strongest audience reaction. 10. Come Sail Away (The Grand Illusion, 1977) began with LG’s prominent 60?second balladesque keyboard introduction during which he sang the first verse. During the interlude between the first and second verses, CP, who came on stage for the second time, RP, and TSu joined LG with their soft bass lines and drum beats. JY played back?up keyboards. When LG sang the last line of the second verse the song’s tempo escalated from a slow ballad to a fairly up tempo power ballad, and JY switched from keyboards to a black Fender Stratocaster. LG then sang the first three lines of the first chorus while standing atop his keyboard stool. After the first chorus the tempo slowed down and LG played atmospheric keyboards for 60 seconds amidst blue stage lights. The tempo once again escalated with TSu’s hard hitting of his snare and tom?tom drums prompting LG to jump off his keyboard riser and sing the second chorus in extended form while walking around stage front. TSh, JY, and CP stood next to one another center stage a few feet in front of TSu’s drum set while RP stood on the rear part of TSu’s drum riser facing the crowd. The fog machine emitted fog as TSh played a memorable guitar solo, part of which he played on his knees leaning back to hit the high notes while LG stood atop him striking his hands in the air in beat with TSu’s drum beats. The band then digressed from the second chorus for audience participation. LG said, “I look out Concord and see commitment to classic rock.” LG sang a brief part of the chorus of four classic rock songs during which he encouraged the audience to sing along, namely Whole Lotta Love (Led Zeppelin cover: Led Zeppelin II, 1969), It’s Only Rock ‘n’ Roll (But I Like It) (The Rolling Stones cover: It’s Only Rock ‘n’ Roll, 1974), Another Brick in the Wall (Pink Floyd cover: The Wall, 1979), and War Pigs (Black Sabbath cover: Paranoid, 1970). LG said, “Give it up for Ronnie James [Dio].” Come Sail Away, Miss America, and one other song to be performed received the strongest audience reaction. The band left the stage at 9:04 and returned in less than one minute to play two additional songs. When the band appeared on stage they tossed two black frisbees bearing white Styx logos in the crowd. LG appeared without his tie. After TSh’s guitar solo the band sang the third chorus. During the final line of the third chorus the tempo slightly slowed down for 20 seconds but resumed a fairly up tempo pace during the fourth and final chorus. The band jammed for 15 seconds at the end of the song during which LG repeatedly rubbed his buttocks back and forth across his keyboard keys. [Fortunately for the fans it was LG doing the rubbing and not me as I would have caused each key to dislodge as a casualty of my not?so?girlish figure.] Blue Collar Man, Miss America, and Come Sail Away received the strongest audience reaction. JY played a fiery 40?second guitar solo while TSh stood on the steps adjacent stage left to TSu’s drum set and RP stood on the steps adjacent stage right to TSu’s drum set. The band repeated the first chorus and first verse. TSh, JY, and RP then came stage front, stood next to one another, and jammed for two minutes. At the conclusion of Renegade the band members left the stage and returned in a few seconds with black and white beach balls they batted, threw and, in the case of LG, shot into the crowd using a hockey stick. The band took a bow and left the stage. 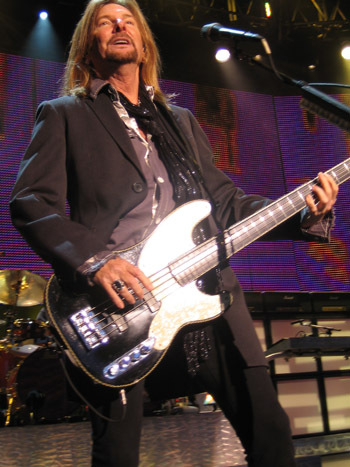 This entry was posted in Concert Reviews and tagged Styx. Bookmark the permalink.